A dramatic hardy plant for year-round interest with colour changing foliage! 'Fire Power' produces deep orange foliage that intensifies and darkens red as colder temperatures set in. It also produces deep red berries too adding to the depth of colour, followed by white blossom flowers in the spring. Grows in almost any soils and sun or shade, in containers or in the garden soil - easy care and hardy. One of the finest shrubs you can grow for spectacular winter colour from both leaves and red berries - this is a plant that should be in everyone's winter garden. Also known as the sacred or heavenly bamboo, Nandina is totally winter-hardy and tough as old boots! With a bamboo-like habit, several upright stems emerge from a tight clump of leaves which in spring and summer is mid-green with the odd reddish or purplish tinge on new shoots. It produces small white flowers, but it really comes into its own as the temperatures drop in autumn. The leaves turn spectacular bonfire orange red, perfect for Halloween and autumn colour, and keep getting darker red as it gets colder. The flowers have given way to berries, much like our own much-loved holly, which themselves get redder and redder too, so the whole plant is a frenzy of colour in full winter. Great as a specimen in a pot, so you can move it near the door to lift your spirits on dark days, or equally at home in the soil in a mixed border planting. In Japan, it is traditionally grown near a door, so if you awake from a nightmare, you can tell your Nandina about your dream so that it cannot harm you! Supplied as an established plant in a 3L pot ready for planting out or potting into your favourite container! Supplied in a 3L pot, ready to plant out all year, approx 30-40cm tall in full leaf. Nandina doesn't like being planted too deeply. 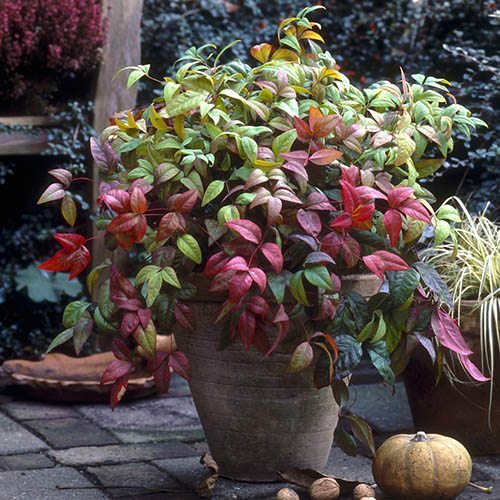 When planting, the top roots of the Nandina should barely be in the soil. Nandina prefers acid to neutral soil, especially if it is rich in organic matter and kept regularly watered. Plants hate sitting in wet soil, so will benefit from added grit to the planting hole if your soil is heavy. Plant in full sun if you want the best colour, however Nandina will also perform well in light shade.